Warm and sunny; Winter (December to February) can be lovely and warm with clear blue skies and bright sunshine. Temperature charts show average daytime temperatures of around 18°C – 20°C. Having visited in February, I can vouch that temperatures can reach 26°C which is hot in anyone’s book (and especially if you’ve come from the UK!). Be prepared for cool nights (around 10°C) and pack something warm. Short flight; The flight time from UK to Marrakesh is around 4 hours. Fly direct with Easyjet, Ryanair, Thomson and Royal Air Maroc at the moment. (British Airways and BMI are both introducing flights from March/April 2011). Same time zone; When the UK is on GMT ie. end of October to March, there is no time difference between the UK and Marrakesh, so no jetlag to contend with; just arrive and away you go. 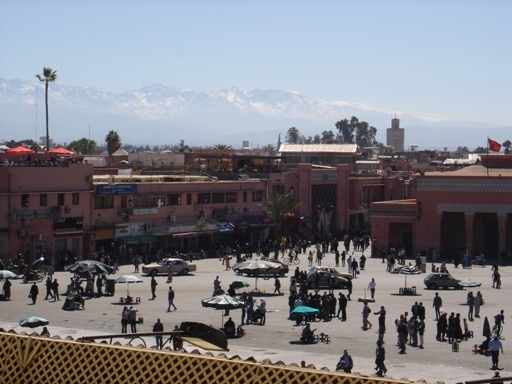 Cultural experience; Just 4 hours away, Marrakesh is a great tonic to grey UK winters. Your senses awaken with a jolt as you wander through the maze of Marrakesh’s souks, haggle for leather babouches slippers, dodge the donkey carts and mopeds, watch the sunset over Djemaa el Fna as you hear the call to prayer. Relaxing riads; For an authentic stay, choose from the many charming riad guest-houses. Restored with Moroccan craftsmanship, with a garden, a courtyard, a roof terrace, or even a heated swimming pool, riads offer a calm and relaxing oasis to the city streets. 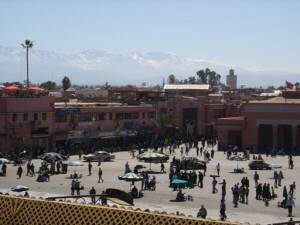 This entry was posted in Destination Insights, Need an idea and tagged Add new tag, Marrakesh, Winter holiday destination. Bookmark the permalink. we are off to Marrakesh at Easter and wondered how safe it will be for single women? Thanks for the question, Alison. It’s widely accepted that Marrakesh is quite safe for single women. You will be attracting attention anyway as a tourist and single or groups of women may arguably attract more attention. However, this is probably more out of curiosity. Follow all the usual precautions as you would when visiting a busy city, be respectful of the fact that you are in a Muslim country ie. dress modestlyly and keep up-to-date with travel advice from the Foreign Office (www.fco.gov.uk). Hope that helps. Hi Ching, hope you’re well. I’ve been to Marrakech numerous times as a solo female traveller and have had absolutely no problems. It’s a fantastic place with lots to see and do and wonderful shopping. Marrakech is so used to tourists and it’s very safe. Yes, you’ll get hassled in the souk but, you do even if you’re with a man. Marrakech is very liberal so clothes wise you don’t have to fully cover up but, having said that I often do see women dressed with very short skirts and strappy tops and think that is a little disrespectful. Go and enjoy the experience! Is it better to have accommodation in the city centre or just outside with small children? Thanks for your feedback, Anna. Always good to get a personal take on this. The 48 hours in Marrakech is a useful piece, too. Thanks. Hi Lesley-Ann. Thanks for stopping by :) and for the useful advice. As visitors to a country, erring on the side of caution is a good path to take when it comes to respecting local and religious customs and I agree with you; Marrakech may be more liberal than other cities, but I would suggest that shorts and strappy vests at the Koutoubia Mosque (as I saw) are not appropriate. Hi Bronwyn. Thanks for your question. I think it depends on the facilities at your accommodation. A city centre location is great for dipping in and out of the bustle of the medina, but space is limited so I would suggest you would need some entertainemnt in the riad too eg. child-friendly pool, games, DVD. Accommodation outside the medina tends to more grounds ie. more space for children to run around. It’s a good question and, if I may, I’ll follow up with a blogpost.